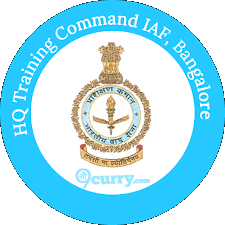 HQ Training Command IAF Bangalore invites applications from eligible Indian Citizens for direct recruitment of following Group 'C' Civilian Posts in various Stations / Units under Indian Air Force (IAF), HQ Training Command, Bangalore. Other details like age limit, educational qualification, selection process, application fee and how to apply are given below. LDC: (1) Essential - Matric with 12th Class or equivalent qualification from a recognized Board or University. A typing speed of 30 wpm in English or 25 wpm in Hindi or manual typewriter; or A typing speed of 35 wpm in English or 30 wpm in Hindi on the computer (35 wpm and 30 wmp correspond to 10500 KDPH/9000 KDPH on an average of 5 key depressions for each word). (2) Desirable - Knowledge of MS Office based applications. Civilian Mechanical Transport Driver: (1) Matriculation pass or equivalent qualification from a recognized board or university. (2) Must be holding a valid civil driving license for light and heavy vehicles. (3) Must possess professional skill in driving and knowledge of motor mechanism. (4) Minimum two years experience. Painter: (1) Industrial Training Institute (ITI) certificate in the appropriate / akin field or trade viz. Painter or Ex-servicemen in appropriate trade viz. Painter. Carpenter: (1) Industrial Training Institute (ITI) certificate in the appropriate / akin field or trade viz. Carpenter or Ex-Serviceman in appropriate trade viz Carpenter Rigger. Cook: (1) Matriculation pass or equivalent qualification from a recognized board or university. (2) Six months experience in trade; or Ex-Serviceman in similar/ akin/ field or trade. MTS: (1) Essential - Matriculation pass or equivalent qualification from a recognized Board or University. (2) Desirable - One year of experience as Watchman or Lascar or Gestetner Operator or Gardener from an Organization or Institute. Mess Staff: (1) Essential - Matriculation pass or equivalent qualification from a recognized Board or University. (2) Desirable - One year of experience as Waiter or Washer up from an Organization or Institute. Ayah/ Ward Sahayika: (1) Essential - Matriculation pass or equivalent qualification from a recognized Board or University. (2) Desirable - One year of experience as Ayah, in Hospitals or Nursing Homes from an Organization or Institute. House Keeping Staff: (1) Matriculation pass or equivalent qualification from a recognized Board or University. Cadet Orderly: (1) Essential - Matriculation pass or equivalent qualification from a recognized Board or University. (2) Desirable - One year of experience as Orderly from an Organization or Institute. Age Limit: (As on the last date of receipt of application): 18-25 years. candidates applying for unreserved posts are not entitled to any relaxation in age limit. (d) Self addressed/stamped envelope of size 24 x 11 Centimeters. (e) Any other documents supporting their candidature.